My friend Andy (from school) and his wife invited me to their townhouse association’s mass garage sale yesterday. They live at “Village on the Green” in Waikele, only a few blocks away. I was tremendously blessed. The garage sale was a big success. It went well…. ridiculously well! I fully packed my truck (the bed and the interior) with items that I wanted to unload. I must’ve hauled a couple hundred pounds of stuff! This photo was taken near the end of my stay which was only three hours. 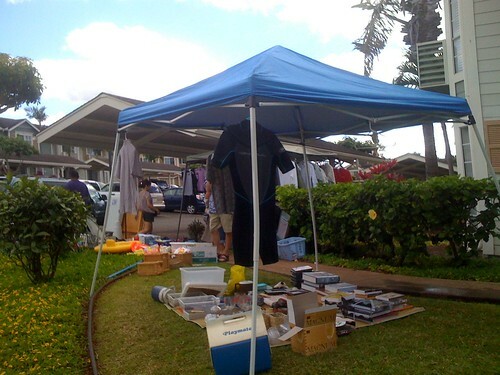 I was able to sell 2 bookshelves, a tv stand, a PS2, broken Oakley shades, Churchill fins, computer speakers, a diving mask & snorkel, a slow cooker, a 30 yr. old rice cooker, aluminum foil, baby powder, hangers, a coffee maker, a golf jacket, jeans, knives, plastic containers, a walker, a blow dryer, a UH football jersey, a rake, an ironing board, tons of books, a bunch of DVDs, a DVD stand, lots of dishware, an exercise ball, wine glasses, chopsticks, envelopes, and a bucket…. ….all in the first hour! God sent customers over with vans. I even had repeat customers who came back a half-hour later. The best part was that I didn’t have to repack unsold items. The association was willing to collect the leftovers and donate them to charity. I had to pinch myself! I left after three hours (I was more than satisfied.) It was totally ridiculous….